(NewsUSA) - If you want to make your workday a bit better, just turn to coffee. That's according to a survey where coffee was identified as key to securing some of offices' best business deals, improving networking and giving office workers a feeling of being at their best. In fact, the recent survey conducted by Harris Poll and Keurig Green Mountain showed that of the 843 adults who were interviewed (presumably around the coffee machine), 89 percent said a good cup of coffee makes their entire workday even better. "Clearly, coffee plays an important role in our society and means so much more than just taking a break from work," says Nicole Williams, Career Expert and founder of WORKS. "It has become a way of bringing individuals together, for colleagues to brainstorm or collaborate, to interact with your boss in a more casual way or even spark one's own creativity." Without their daily cup of joe, coffee drinkers can feel a range of negative emotions -- exhausted (36 percent), irritable (35 percent), unproductive (30 percent), disorganized (20 percent) or forgetful (14 percent). The data only re-enforced Keurig's take that coffee has a variety of surprising social and professional benefits, which is why the company took on a new challenge -- to brew a better carafe of coffee, faster. With its new BOLT System, Keurig believes it has changed the way coffee is brewed in the workplace. The company challenged its engineers to come up with something nearly everyone in the office will appreciate -- a system that brews a better pot of coffee with no mess in two minutes. What came of the collaboration between the mechanical and electrical engineers and software team was a system that could brew 64 ounces of delicious fresh coffee, faster than ever before -- which may be a huge boon for office workers' productivity. "The next time you plan a big meeting, go one step further by making a large carafe for everyone in the room," says Williams. "Almost half of office workers who drink coffee agree that coffee has been the key to making some of their office's best business deals happen. The more time and effort you put into planning a great meeting, the better your team will appreciate you and the task at hand." 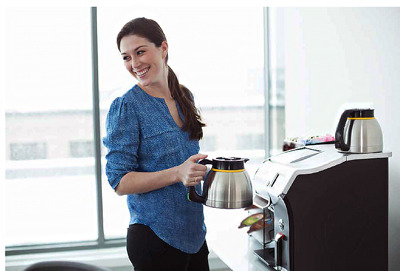 To learn more about the future of office coffee, visit keurig.com/Bolt.